One John Mayer song that's always resonated with me is the somewhat unheralded 83. In the song, Mayer reflects longingly on the times when he was a young boy in 1983. Since Mayer and I are almost the same age the theme really hit home. And this week I've been able to live that theme out a little - at least on my lunch breaks. For 4 out of 5 days this week I've ended up heading over to my parents house for lunch. Now I'm a good son and love my folks, so I'll usually I'll pop in once a week. But circumstances (including my girls being over there twice this week) just seemed to draw me over a little more often than usual. And after some extremely busy times at the office of late, being at home has provided a much needed escape. But during one trip back in time this week I was jolted by the announcement that an icon from my childhood was going to literally be torn apart. 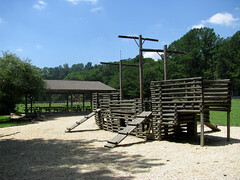 The old 'pirate ship' from our neighborhood's central park is scheduled for demolition tomorrow. It's not just the fact that I spent many hours of my childhood playing at the park that has me saddened. It's the fact that my dad was the one largely responsible for the park (and particularly the ship's) creation. The original neighborhood builder had left the land undeveloped. But my dad was the one who actually got the ball rolling to develop the area by designing the entire layout for the park. The fence, the pavilion, the swings, the soccer field and (the centerpiece) the pirate ship. It was all his baby. And together with several other neighborhood families we built it all ourselves. So obviously the news that it was to be torn down didn't exactly fill me with joy. I decided to visit the old ship once more on lunch break today. It's actually still in remarkable shape for being over 25 years old. A few boards could stand to be replaced here or there, but overall it was still extremely stout as I climbed aboard. In fact, Holly and I were so impressed with its condition and the general facilities of the park the we had actually been considering it a possible location for Laney's birthday party. But I guess that idea is now off the table. Even if they replace the ship with a more modern playground (which I doubt they'll do given the cost) it just wouldn't be the same. Oh well. Thanks Dad for all the hard work and the memories. They were worth it.